Underworld: Rise of the Lycans is a 2009 American action horror film directed by Patrick Tatopoulos. 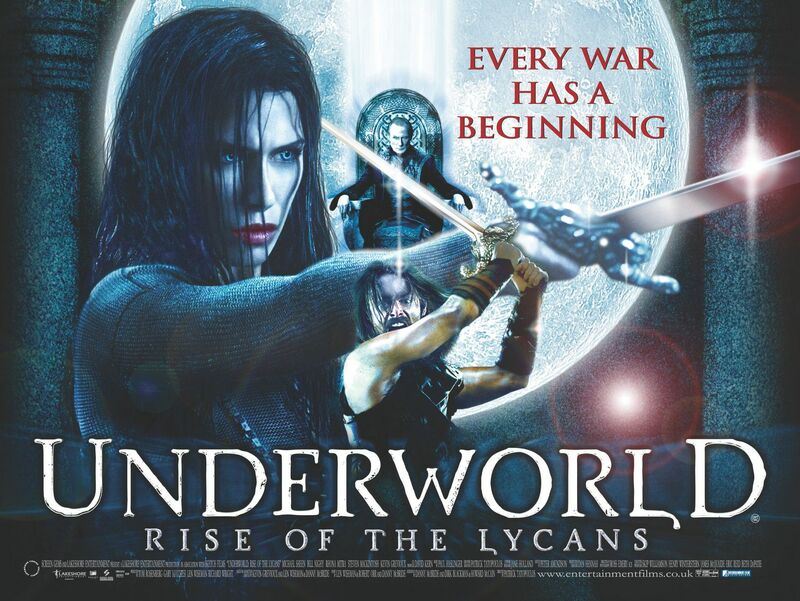 It is the third (chronologically, the first) installment and the prequel to the Underworld film series, focusing primarily on the origins of the characters and the events that lead up to the Vampire–Lycan war, depicted in the previous films Underworld (2003) and Underworld: Evolution (2006). "The film tells the story of Lucian, the first werewolf born capable of taking human form and the first to be called a Lycan. Viktor, a vampire elder, raises the child, and envisions a race of Lycan slaves that could guard the coven's fortress during the day and be used as laborers by the vampires at night. The forests and the countryside are indeed filled with savage werewolves born from William's rampage, and human nobles have taken to asking Viktor for protection against the beasts, protection Viktor grants in exchange for a tribute of silver, with which to keep his slaves under control. As Lucian grows up, he and Viktor's daughter Sonja (Rhona Mitra) fall in love and begin a secretive intimate relationship in their adult years. Sonja is reckless and insubordinate, and one night Lucian escapes and rescues Sonja from his werewolf brethren. Viktor, despite acknowledging that Lucian saved his daughter, cannot forgive the escape and locks Lucian away. With the help of Andreas Tanis, Sonja orchestrates Lucian's release in exchange for her seat on the vampire council. Lucian, unable to flee alone, decides to escape after liberating all of the other Lycans. Sonja remains behind but will meet Lucian in three days. While preparing to leave she is visited by her father. Viktor asks if she assisted in Lucian's escape, and although she denies it, he discovers the real truth after biting her neck and reading her memories through her blood. Discovering her relationship with Lucian, he then imprisons her. Meanwhile, in the forest, Lucian recruits both human slaves and werewolves to form a force against the vampires. In the fortress, the vampire council and nobles demand that Viktor recapture Lucian, as his Lycans have been attacking human estates and freeing their slaves and offering them immortality as Lycans themselves. Viktor replies that he is confident Lucian will return as he has something Lucian wants, Sonja. Lucian learns about Sonja's imprisonment and eventually rescues her from her room but they are stopped from escaping by Viktor. Sonja, hoping to spare Lucian's life, reveals to Viktor that she is pregnant with Lucian's child. Disgusted, Viktor overpowers her and imprisons both her and Lucian. Sonja is unanimously sentenced to death by the council at a trial presided over by her father, and is executed by exposure to sunlight in Lucian's presence. Viktor later visits her body and retrieves her pendant. Lucian tries to escape the fortress but his attempt is thwarted by the Death Dealers; Lucian, now able to communicate with and control the wild werewolves, summons them to storm the fortress. In the melee, the Vampire Council members are killed along with their aides and lesser vampire nobles. When realizing that Viktor intends to flee, Lucian pursues him, and they fight. Lucian manages to trap Viktor by exposing him to shafts of sunlight and then stabs Viktor through the mouth with a sword and pushes his body down into a nearby body of water. With the battle over, Lucian's deputy Raze declares that ""it is finished"", but Lucian realizes this victory is only the beginning of what will become a war between the races. The film's coda reveals that Viktor has survived his wound, has made it onto a vampire ship fleeing the fortress, and is sealed into an elder hibernation chamber by Tanis. Also, the opening scene of the first Underworld film is shown, with the voice of vampire Kraven (Shane Brolly) revealing to Selene (Kate Beckinsale) that Viktor had killed her family, not the Lycans, but had spared her life because she reminded him of his executed daughter Sonja; Selene, unaware of the truth, dismisses Kraven's statement as ""lies""."